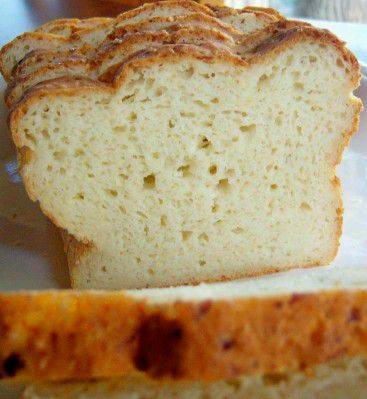 Moist and easy-to-make gluten-free cottage cheese bread is a soft, pliable gluten-free yeast bread. If you've had trouble finding a kid-friendly gluten-free bread, try this recipe. There's nothing dry or crumbly about this bread. Lightly grease an 8x4-inch loaf pan, preferably a steel pan. Combine all dry ingredients, including dry yeast in a large bowl and whisk to blend. Combine egg, cottage cheese, honey, oil and warm (not hot) water in a mixing bowl. Add dry ingredients and beat with an electric hand or stand mixer on medium speed for 2 minutes. If the batter is too stiff add more water — 1 tablespoon at a time. Use a spatula to scrape the bread batter into prepared pan. Press the batter down in the pan and smooth the top. Dip the spatula or your fingers in water and smooth the top of the loaf. Set the pan in a warm, draft-free location and let the batter rise for about 30 minutes. Don't let the bread over-rise or it may collapse during baking. The batter should rise no higher than the top rim of the loaf pan before baking. Bake in preheated oven for about 50 minutes. After baking for 30 minutes, if the loaf is brown on top cover with foil to prevent over-browning. If you use a digital thermometer, the bread is done when the internal temperature is 205-208 degrees in the middle of the loaf. Remove the loaf from the pan immediately and allow to cool completely on a wire rack before slicing. If you try to slice the bread before it's cool, it will be much harder to slice. Be patient. When completely cool, the bread slices nicely!